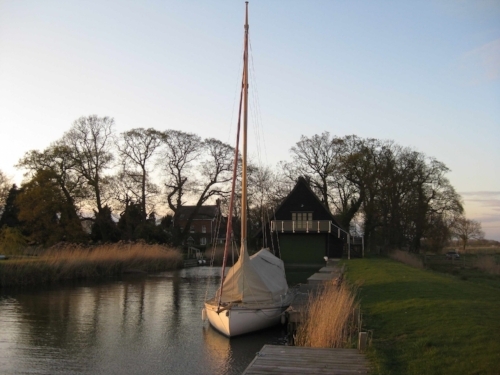 Discover the timeless beauty of the broads, on a sailing yacht holiday, with family and friends. New for 2019 Sea Breeze - 2 berth yacht. 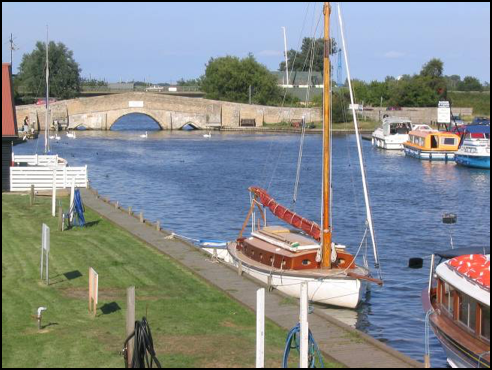 and a comprehensive yacht handover with 40 minuets sailing if required. Bright Spark has a racing pedigree and is maintained to the highest standard. 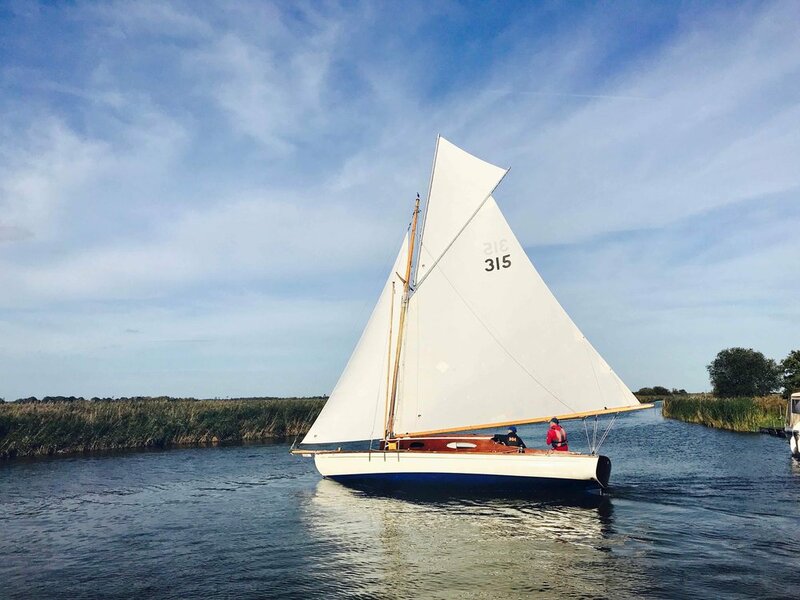 Equipped with an integral topsail she will perform in the lightest of breezes, but can be quickly reefed in strong winds. 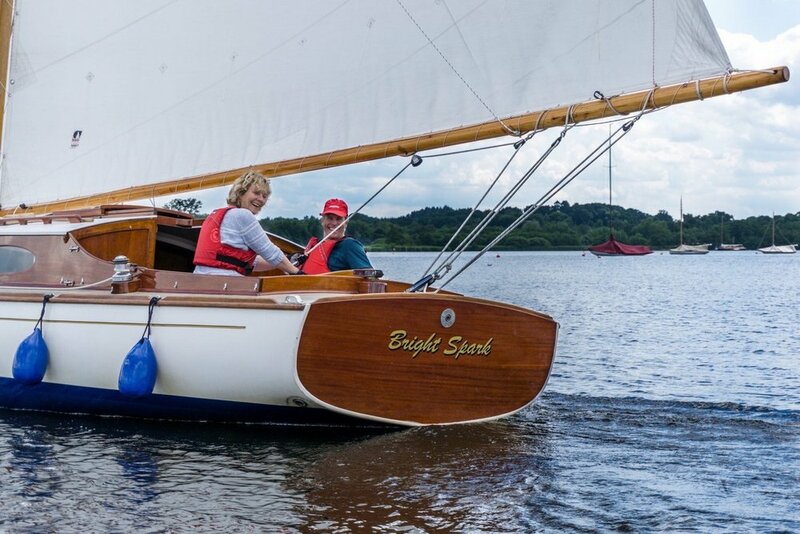 Easy to sail with beautiful handling characteristics. Elegant, spacious and comfortable. Two tea towels, washing up liquid, dish cloths, two toilet rolls. Luxury down feel duvets and pillows. All bedding and towels provided. Toilet and shower closet with pull out sink. 28 feet long by 9.6 feet wide (plus small bow sprit). 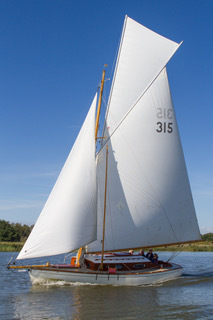 Gaff rig with integral topsail 615 sq ft sail area. Complimentary welcome hamper includes: Tea, coffee, milk, sugar, olive oil, biscuits, free range eggs and free range bacon. Accommodation for 2-5 people sleeping in two cabins plus one person sleeping in the cockpit. Large cockpit with sturdy removable table. We have squeezed 8 around the table for a meal. 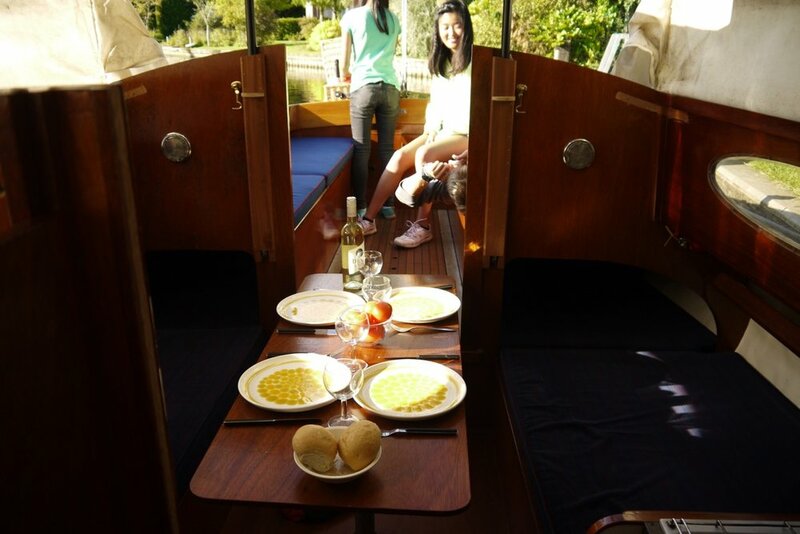 The first cabin has a removable table seating 5 people for meals and social occasions. Full length lifting roof, providing 6 feet of standing room. Blown air heating, to the cockpit and the main cabin. 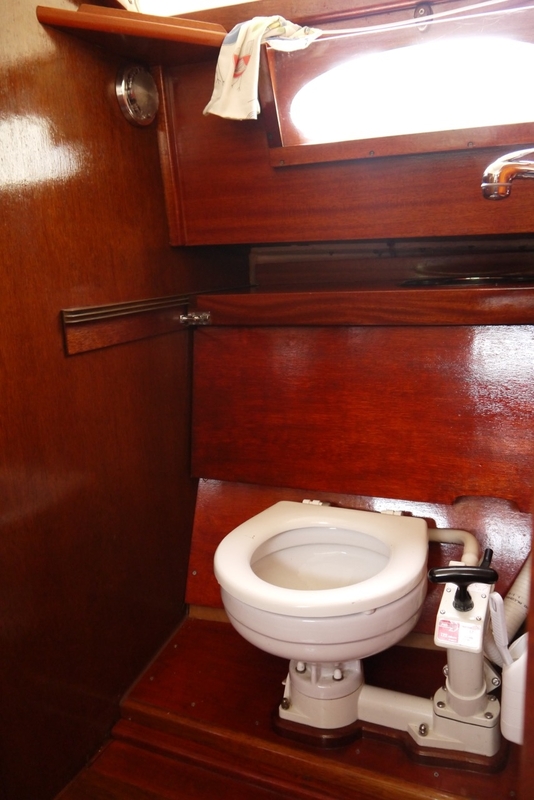 Large galley with double gas hob, grill, oven, sink, draining board and storage cupboards. Fridge. The boat is well stocked with good quality, china, cutlery, glasses, good quality saucepans, a large non stick frying pan and caffetire. Toilet with separate sink and hand held shower. Hot and cold water taps. Luxury down feel cotton duvets and pillows. Bedding and towels provided. 30 feet long by 9.6 feet wide (plus small bow sprit). Gaff Rig 700 sq ft of sail area. Complimentary welcome hamper includes: Tea, coffee, milk, sugar, olive oil, biscuits, half a dozen free range eggs and free range bacon. Accommodation is for 2-5 people in two cabins. One double berth and three singles. Plus one person sleeping in the cockpit. Large cockpit with a removable table. Can comfortably seat six people. Lifting roof, 6 feet of head room. 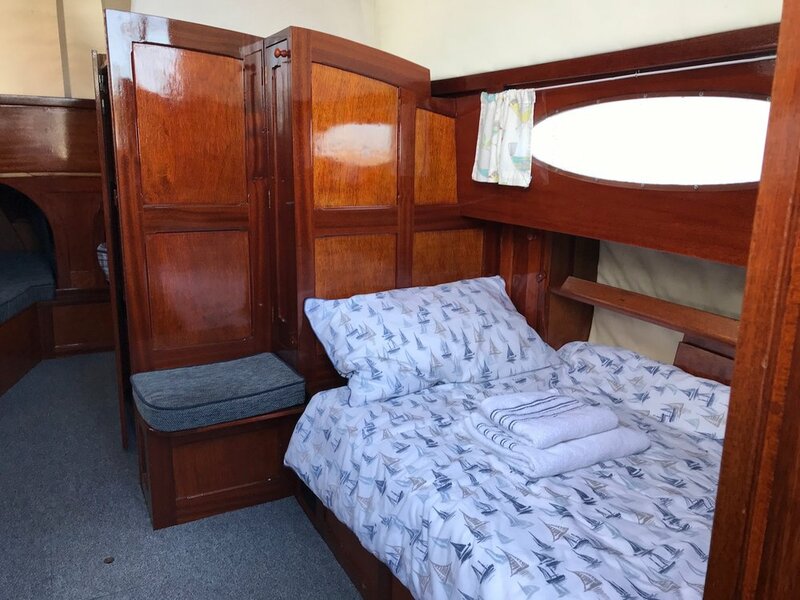 Large galley with double gas hob, grill, oven, sink, draining board and storage cupboards and fridge. Good quality vintage china, cutlery, glasses, good quality saucepans, a large non stick frying pan and caffetire. 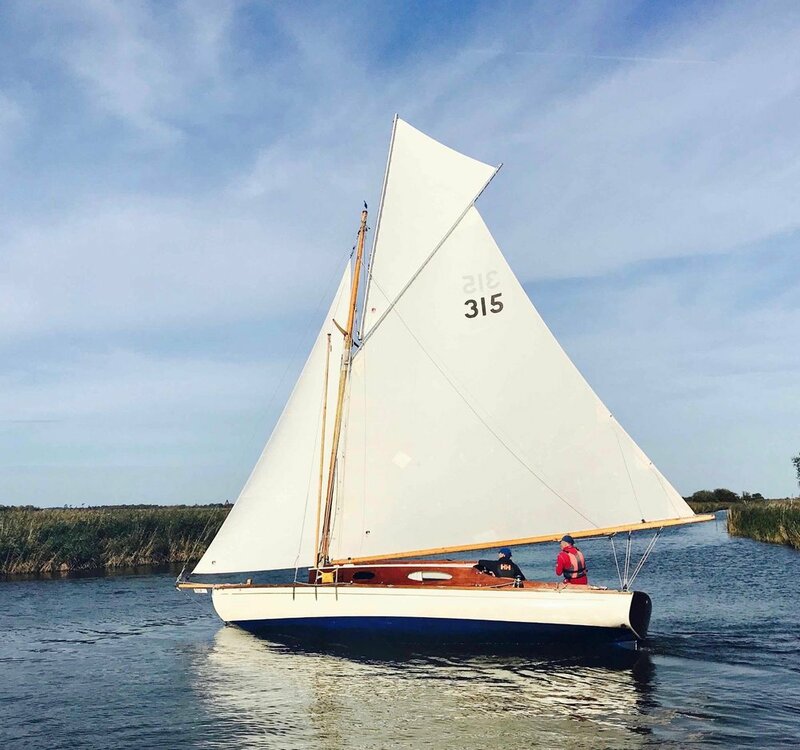 The smallest boat in Oliver’s Sailing Holidays fleet, 25ft long, Seabreeze has all the facilities of our larger boats but in a compact two-berth yacht. 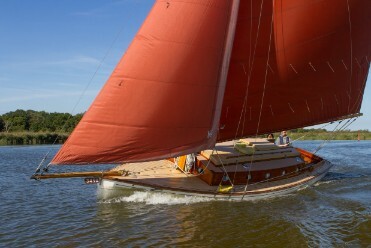 She has the traditional gaff rig ideally suited to the Norfolk Broads. 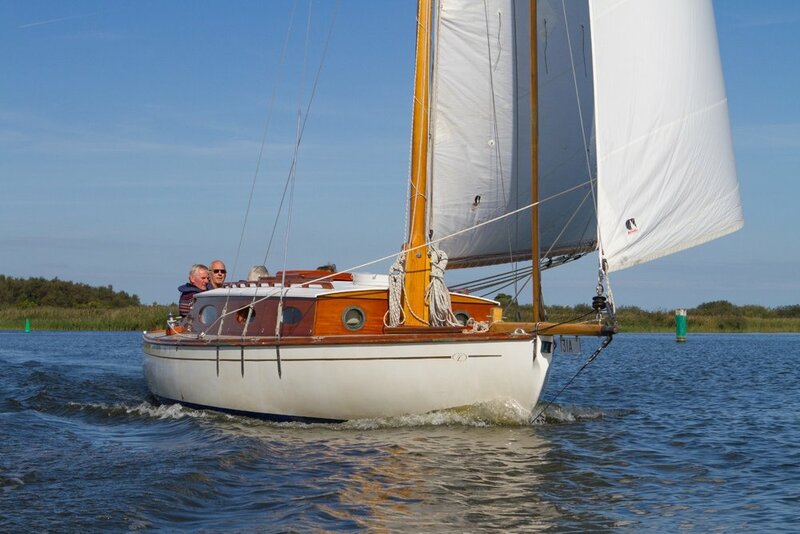 She is maintained to a very high standard and sails beautifully in all conditions. Spacious and extremely comfortable accommodation for two people. 25ft long by 9”.6’ feet wide (plus small bow sprit). Large cockpit with sturdy removable table. Sleeps 2 in the cabin and 2 people can sleep in the cockpit. The cabin has a removable table. 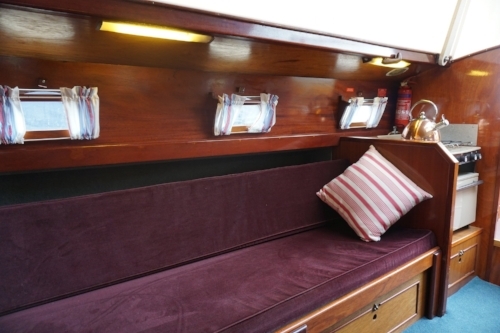 Large galley with double gas hob, grill, oven, sink, draining board and storage cupboards. 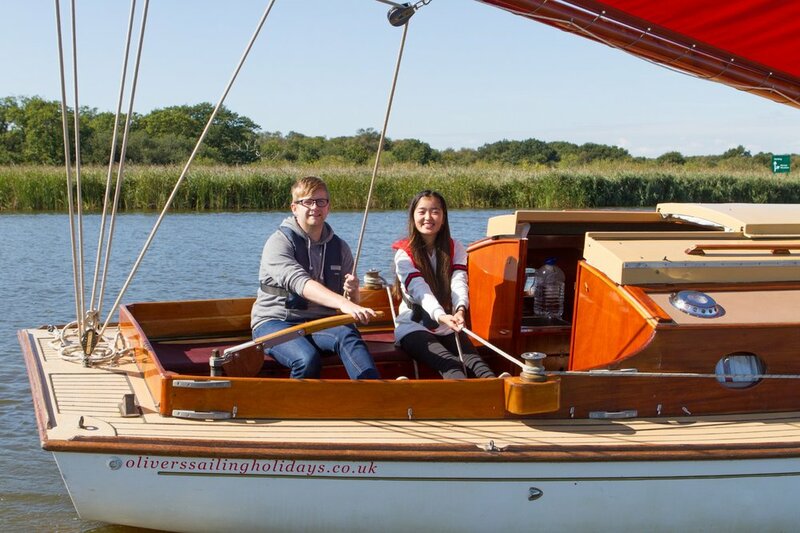 The boat is well stocked with good quality, china, cutlery,glasses, good quality saucepans, a large non stick frying pan and cafetiere.